I know I getting older when the young woman that has adorned the opening page at Signature Homes' website retires after only 2 years on the job. Every time I visited their site, I found myself staying a few extra moments just to hear her voice. But that's the way things happen on the Internet. Here today, gone tomorrow. Think MySpace! Over the weekend, Signature Homes has launched a completely new and exciting website that looks very nice and informative. Visit it and leave a comment with your thoughts on their new site. I'm just sorry I didn't have a chance to say goodbye to her or get her name before they retired her to wherever digitally created people go. Coach I agree with your assertions regarding Signature web site. Fresh, informative and easy to negotiate. However, I did find some hesitancy in loading of the site and some pages. I first thought it might have been loading from the Blog, but I then went direct to the site and had similar problems. May be my ISP. Vic has aged well. Is that his son with him on the opening photo of the web site? Yes, that is Vic's son Justin. Can you tell who will take the helm in a few years? It has to be heartwarming to have you son being groomed to take over the business - if that is what both of you want. Also refreshing to see that he is willing to "put in the needed time" to learn the business; and who better to learn from than his father. Wiliam, Thanks, that was nice of you to say. For the longest time I thojught he would want something else, than being involved in this business, but when he decided to join us in this, I was and continue to be thrilled. I am a very happy and proud father. 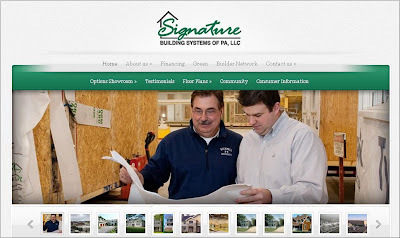 Vic, I am always pleased to write good things about Signature Homes. I know Justin and he will make you proud as he moves up the corporate ladder and takes over the big office when you decide to retire in 2050.